This past fall, the Milwaukee County Zoo welcomed a two-year-old male red kangaroo, named Willeroo, to the Australia Building. He joins our small mob of three females, Maybelle, Gidget and Ellie May – all age seven – and our male, Ace, age one and a half. Willeroo was acquired from the Kansas City Zoo as our new breeding dominant male, and within two weeks of joining the mob, he started breeding with Maybelle! 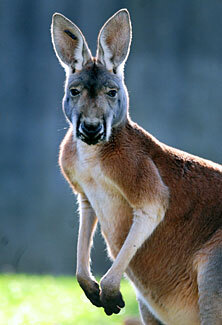 At two years old, Willeroo is still considered an adolescent and has some maturing ahead of him. By the time he reaches adulthood, he will weigh over 100 pounds. Although he is skittish around his keepers, he has made friends with Ace. They can often be seen together sparring and wrestling. To pick out Willeroo in the mob, look for the blue I.D. tag in his right ear. 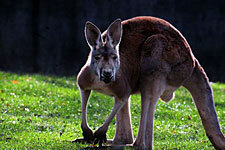 Visit Willeroo, and all of our kangaroos, in the Australia Building. They can be seen both inside the building and outside in the yard.